What's better than Netflix, pizza, and hanging out with your best friend on a lazy Saturday? Nothing, at least not that I can think of! I'd had in my head for awhile a cozy, lifestyle lazy-day boudoir session that I was just dying to make a reality. When Graysie popped up on my feed, her big smile was exactly what I was looking for! I messaged her right away to see if she'd be down for the vision I had in my mind, and she was. Even better, she suggested bringing her friend Connie, so we also turned it into a BFF shoot too! I spent several days making sure my bedroom was ready to go and just what I envisioned for this session. Cute, simple, and cozy. Then I spent several hours combing through Urban Outfitters and Forever 21, looking for the perfect outfits and graphic tees to bring it all together! In the end, Graysie, Connie and I spent a gorgeous winter morning jamming out to chill tunes, jumping around in the comfiest clothes, and laughing and stuffing our faces full of pizza. Exactly what should happen on any Saturday spent lounging around, am I right? Thank you both for being up for anything and everything I wanted to try, and for letting my vision become a reality! I loved working with you guys and getting to know you better. 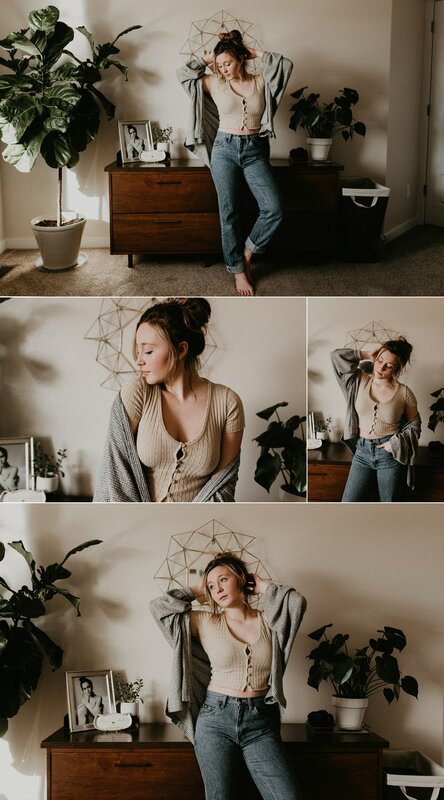 If pizza, oversized tees, messy buns, and lounging around in your underwear sounds like heaven to you, then let's chat and book your own lifestyle boudoir session! Just click "contact" at the bottom of this blog post for more info.